As-Suffa Outreach | On Yer Bike! 2016 is now live to register! UNITY Ride for Change. 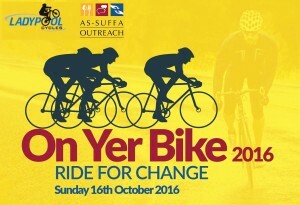 Cyclists of all experiences from across the UK will ride to raise money for As-Suffa Outreach Charity. We cater for the local and wider community in the UK, providing support and services for the vulnerable, needy and young, irrespective of their background. Register today to participate in this unique charity ride and raise funds to help continue caring for our growing number of service users.